Some time in the past. DarkLord delivers a briefing to Dark Dragon regarding their mission to transfer the surface of their native Darkworld with that of Earth. It is noted that in most realities that Dragon is a wildcard and his presence has altered the course of history. The communal mind that is inhabited by every version of DarkLord has discussed the matter and they ensured that the television broadcasts that shaped Dark Dragon’s personality would secure his loyalty to their cause. Dark Dragon went across to Earth during one of the land transfers but DarkLord was killed in the meantime and Darkworld was destroyed. He was later deposited into Dimension-X before ending up on another Earth where he has been incarcerated for years. Ronald Winston Urass pays Dark Dragon a visit in Stronghold Penitentiary and offers to help. His own diplomatic immunity cannot be extended to release the prisoner but Urass has a plan that will secure Dark Dragon’s freedom. Sometime later, an army of robots raid the prison and one of them destroys Dark Dragon’s manacles, enabling him to move once more. He leaps into battle against the robots and annihilates them all, suffering numerous injuries as a result. This carefully orchestrated event results in Dark Dragon being given a unit of his counterpart’s blood which restores his own regeneration abilities. With his appearance no longer looking monstrous, Dark Dragon pleaded his case before Judge Coffin and is soon granted his parole. Now. 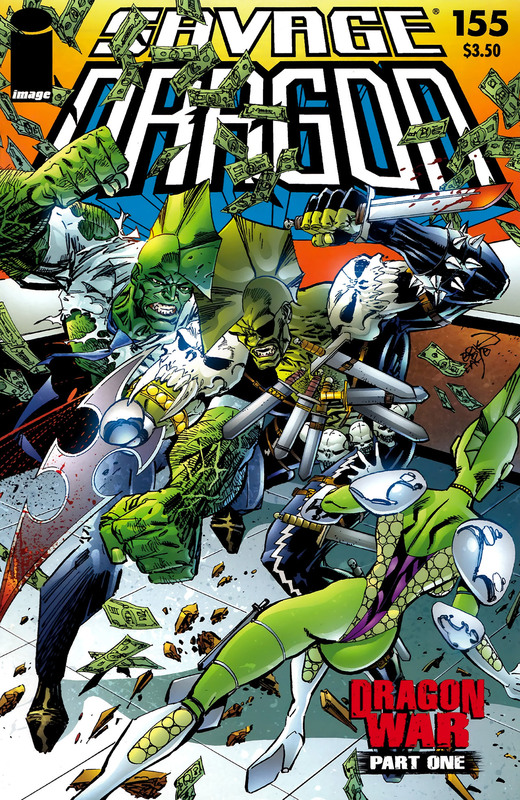 Dragon responds to a bank robbery where he is confronted by Cutthroat and GlowBug, both of whom have been transformed to resemble him. He shatters the blade of Cutthroat who reveals how he and his wife had attempted to get back into the Vicious Circle’s good graces by volunteering to become test subjects. They were injected with a serum that contained Dragon’s blood but the hero cannot understand why they bothered, especially as the couple do not possess his healing factor. Dragon brutally beats down his opponents before reading their rights. Malcolm and Angel stop by the laboratory of Rex Dexter to discuss their concerns about their father as he remains a blank slate. They hope that Rex can somehow extract Dragon’s personality from Virus’s brain and return it to his physical form. This process is far beyond anything that Rex believes he could accomplish but promises to look into it nonetheless. Malcolm starts to grow fearful that Dragon as he knew him really is dead after all. In an effort to gauge the trustworthiness of the newly-amnesiac Dragon, Captain Stewart holds a meeting with Daredevil. He requests that the hero spy on Dragon just to make sure that he is not a menace and can still perform his job. Angel notices the vigilante near her apartment and confronts him, confirming the suspicions that Dragon has undergone a great change. They talk about hanging out together at some point but will keep it a secret from Malcolm, unaware that he is listening on nearby. The seeming success of the new Dragon serum is celebrated by Octopus and OpenFace as they are visited in their laboratory by OverLord. They discuss how their serum restored Cutthroat and GlowBug’s youthful appearance whilst also boosting their immune system. The duo has used diluted Freak Out so that the subjects do not explode like Anarchy did, although repeated injections will be required. It is reasoned that their serum could be used to rejuvenate their older members but do not think it would be wise to use it on their younger colleagues. OverLord points out that the first two recipients of this serum are now in police custody and will not be able to receive a second shot. Over at Hillman Hospital, GlowBug’s pulse starts to quicken before she violently explodes as Dragon’s blood expels itself from her. This death causes Cutthroat to panic and he begs for the doctors to find a way to save his life so that his son will not have to grow up as an orphan. They are powerless to do anything other than watch as the villain shares GlowBug’s fate and explodes. Dr. Roswell’s finger pressed into the head of Galian enables him to scan through his memories and confirm his story. He really had been defending himself whilst still in his powered form of Ethrian and the real reason he came to Earth was to deal with a rogue Ethereal Warrior. General Pike wishes to learn more and is informed that the power lens that he destroyed contained the genetic imprint of Ethrian and this entity has shared the form of many people over the years. Galian collapses to the ground showing no sign of life and Dr. Roswell begs that he be left to simply die. He warns that the power in the lens was not from a god but rather a demon and that it hates humanity for caging it. As General Pike debates whether to kill his prisoner for good, one of the clones starts to stir as energy from Powerhouse is broadcasted. Ethrian then materializes and announces that Powerhouse has informed him that Galian could no longer serve as his host as he does not hail from Earth and so a human will now serve in that role.